MDLA will feature "And Then They Came For Us," a documentary on the internment of Japanese Americans during World War II. Afterwards, we will discuss the film and steps to take to ensure that this dark chapter in history is never repeated with panelists from Minnesota diversity bars, including representatives from the Somali American Bar, Minnesota Hispanic Bar Association, and the Minnesota Association of Black Lawyers. Scholarship recipients will be considered for a paid internship at Carlson Caspers during the summer prior to entering law school and will be considered for a paid clerkship during the summers after their first and second years of law school. Accepted to or have applied to an ABA-accredited law school with intention of beginning first year of law school in the Fall of 2019. The scholarship will be paid upon proof of attendance during the first semester/quarter. China was involved in 90 percent of all economic espionage cases handled by the Department of Justice over the last seven years, according to a report submitted last December to the Senate Intelligence Committee. This fact illustrates a new backdrop for thousands of Twin Cities S.T.E.M. (science, technology, engineering, and mathematics) professionals of all ethnicities navigating career opportunities and avoiding pitfalls in the 21st Century of U.S.-China relations. Please join us for a program focused on educating all Twin Cities S.T.E.M. professionals, academics, and students-many of whom are Asian American-on two competing and ever-emerging phenomena in the U.S. justice system: potential threats on national security and economic espionage with the ascendancy of China on the one hand, and on the other, the potential racial profiling of Asians and Asian Pacific Americans resulting in accusations, such as the cases of Dr. Wen Ho Lee, Professor Xi Xiaoxing, and hydrologist Sherry Chen. 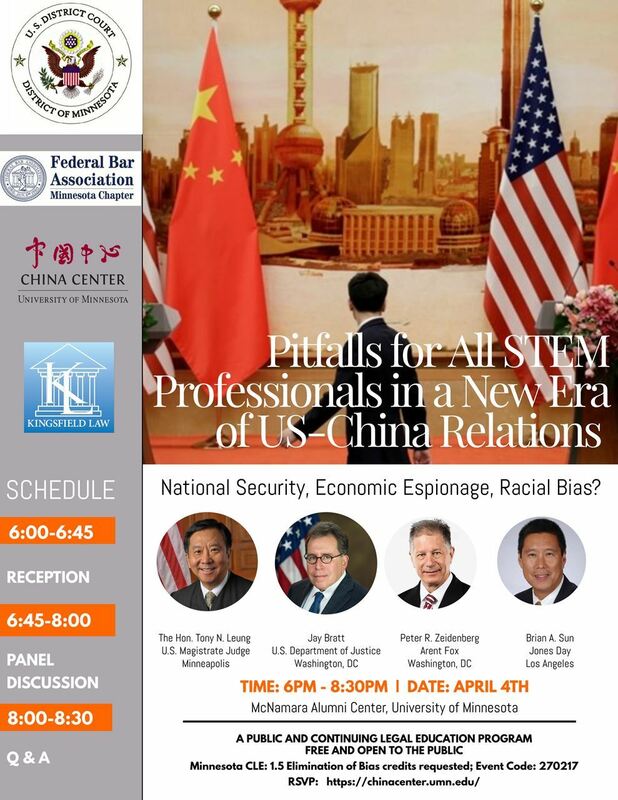 Featured speakers will include Brian Sun, a Los Angeles lawyer who represented Dr. Lee and Peter Zeidenberg, a Washington D.C.-based attorney who represented Dr. Xi and Ms. Chen. The government perspective will be represented by Jay Bratt, the Chief of the Counterintelligence and Export Control Section (CES) of the National Security Division of the Department of Justice, who will speak about U.S. efforts to safeguard national security and curb economic espionage. 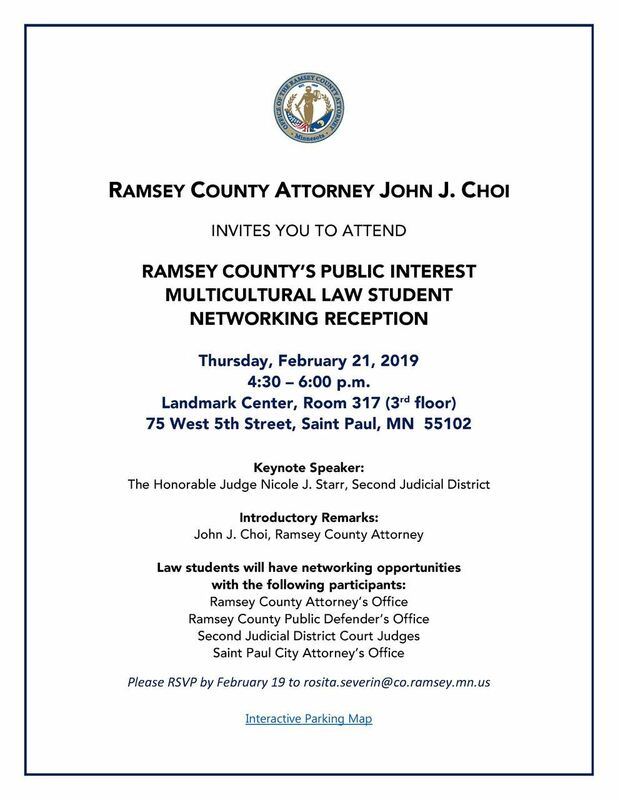 The program is co-sponsored by the University of Minnesota's China Center, the Minnesota Chapter of the Federal Bar Association's Diversity Committee, the United States District Court for the District of Minnesota's Outreach Committee, and Kingsfield Law Office. The University of St. Thomas Law Journal, in partnership with The Infinity Project, presents: Who Decides? Picking Judges in the 21st Century. Program from 9:00 a.m. - 3:00 p.m.
Wine Reception from 3:00 - 4:00 p.m. Professor Linda Greenhouse (Yale Law School) Linda Greenhouse is the Knight Distinguished Journalist in Residence and Joseph M. Goldstein Lecturer in Law at Yale Law School. She is a Pulitzer Prize-winning reporter who covered the United States Supreme Court for nearly three decades for The New York Times. Dean Alberto Gonzales (Belmont University) Dean Gonzales was nominated by President George W. Bush and confirmed by the United States Senate as the 80th Attorney General of the United States in February 2005 and served in that capacity until September 2007. He has worked as a partner at a major Houston law firm (Vinson & Elkins) and held government positions as a Justice on the Texas Supreme Court, Texas Secretary of State, General Counsel to the Governor of Texas and Counsel to the President of the United States. 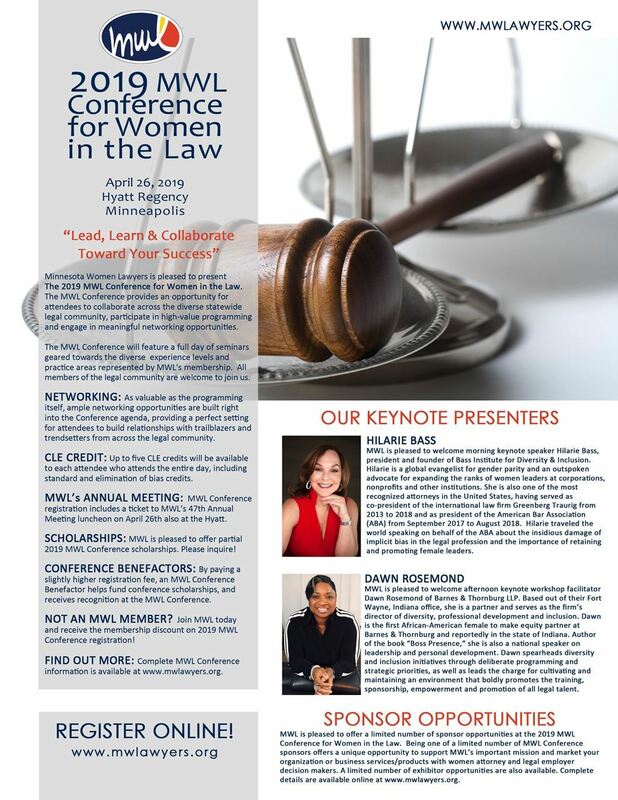 Kim Askew (K&L Gates) Kim Askew practices in the area of complex commercial litigation, and was the first woman of color to chair of the ABA Standing Committee on the Federal Judiciary. In 2005 and from 2012-2018, Lawdragon listed her as one of the "500 Leading Lawyers in America" and Benchmark has frequently named her one of the "Top 250 Women In Litigation." Professor Brian Fitzpatrick (Vanderbilt Law School) Brian T. Fitzpatrick's research at Vanderbilt focuses on federal courts, judicial selection and constitutional law. He graduated first in his class from Harvard Law School and went on to clerk for Judge Diarmuid O'Scannlain on the U.S. Court of Appeals for the Ninth Circuit and Justice Antonin Scalia on the U.S. Supreme Court. Ilya Shapiro (Cato Institute) Ilya Shapiro is the director of the Robert A. Levy Center for Constitutional Studies at the Cato Institute, and often speaks on constitutional issues and judicial selection. Before joining Cato, he was a special assistant/adviser to the Multi-National Force in Iraq on rule-of-law issues, and practiced at Squire Patton Boggs and Cleary Gottlieb. Lena Zwarensteyn (The Leadership Conference on Civil and Human Rights) Lena Zwarensteyn is the Fair Courts Campaign Director for The Leadership Conference and is a frequent speaker on the judicial selection process. She previously served as the Director of Strategic Engagement at the American Constitution Society (ACS), where she oversaw the organization's work on judicial nominations and why courts matter. Tracey George (Vanderbilt Law School) Tracey George brings a social science perspective to a range of topics, including judges and courts, judicial selection and elections, legal education and the legal profession, and contract law and theory. She co-authored The Gavel Gap, a web-based resource highlighting the representativeness of state courts. Lola Velazquez-Aguilu (Medtronic) Lola Velazquez-Aguilu, currently Medtronic's litigation and investigations counsel, is Minnesota's newly appointed Chair of the Commission on Judicial Selection. She has served as a member of the selection commission since 2016, and she is a past-president of The Infinity Project. Judge Celeste Bremer (U.S. District Court) Chief Magistrate Judge Celeste Bremer has served the Southern District of Iowa since 1985. She received The Judge Diana Murphy Legacy Award in 2014 for her ongoing efforts to address inequities in the judicial system, and for encouraging countless women to serve on the bench. This session will be followed by keynote remarks given by Jim Rowader, VP and General Counsel for Labor & Employment at Target. Jim will be discussing his thoughts on the current state of diversity and inclusion in the legal profession. AscendNAAMBA is excited to invite MNAPABA to be a participant in the inaugural Make It MSP Professionals of Color Organizations Mingle! This event will bring together professionals of color organizations from across the Twin Cities and will provide an opportunity to showcase the opportunities and events each offers. It will also feature guest speakers from the 2019 Minneapolis Final Four(r) Local Organizing Committee who will highlight their initiatives to support diversity and inclusion in the community and share exciting news about how you can get involved! Develop new relationships that can lead to new opportunities and partnerships. This exclusive after-hours event will take place at the James J. Hill Center in St Paul on November 29th and will include complimentary appetizers and a hosted bar. 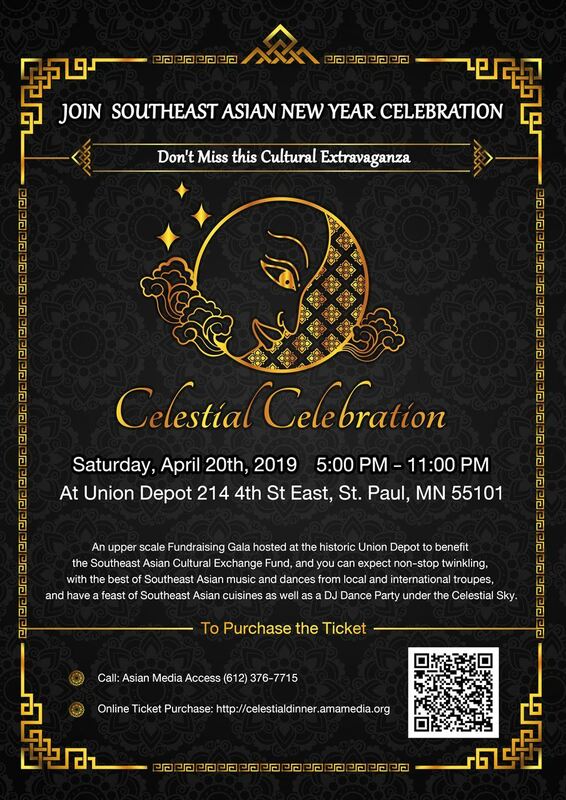 Please contact Vivian Chow, AscendNAAMBA MN Chapter President, at ascendnaamba.mn@gmail.com with questions and to RSVP.